Dholera SIR, India’s First Platinum Rated Greenfield Industrial city about 100 km south of Ahmedabad, is ready to offer to the investors world-class, plug-and-play infrastructure, large land parcels and reliable & affordable amenities that have been benchmarked against the best in the world. 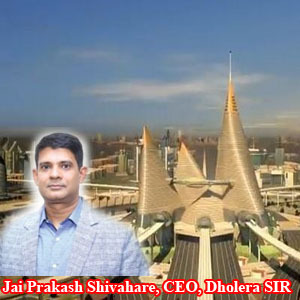 In a candid interview, Jai Prakash Shivahare, CEO, Dholera Special Investment Region Development Authority (DSIRDA) and MD, Dholera Industrial City Development Ltd (DICDL), talks about the strategic advantages of Dholera and mega projects under implementation for this engineering marvel of India. Tell us about the advantages of Dholera Special Investment Region. We have several unique features compared to any other city in India: First, we are creating a world-class ICT enabled plug-and-play infrastructure. Thus, fully serviced land parcels ranging from 5 acres to 370 acres are available for industries to setup their operations immediately. Second, all the utilities like Water, Waste Water, Power, ICT, Urban Planning, and Roads & Underground Utilities are benchmarked against the best in the world in terms of reliability, redundancy and quality of services. These will help industries to reduce their life-cycle cost. For example, in power supply, due to lowest T&D losses, compact area, power ducts with smart metering and future ready infrastructure, Dholera offers one of the lowest power tariffs in the country, thus ensuring huge cost savings on power for the companies during the life cycle of the project. 1. What kinds of opportunities are being presented by this mega project? Due to plug and play ready infrastructure and utilities, many companies that are looking to get started immediately would prefer to be in Dholera and will be able to meet commitments to their clients in time bound manner. As part of Delhi Mumbai Industrial Corridor, Dholera has excellent connectivity with ports as well as hinterland to supply finished goods. Gujarat ranks highest in logistics ranking prepared by LEADS (Logistics Ease Across Different States) Report from Ministry of Commerce & Industry, Government of India in January 2018. Dholera is strategically located between Ahmedabad and Bhavnagar and it is very well connected with the freight corridor, ports, road and rail services. The nearest port at Bhavnagar is just 65 kms from Dholera, Other major ports in the vicinity are Pipavav, Mundra and Kandla. The National Highway Authority of India (NHAI) has already floated the tender for construction of expressway between Dholera and Ahmedabad, which will become operational by February 2021. This will reduce the travel time from Dholera to Ahmedabad to about one hour. The Metro rail between Ahmedabad and Dholera, will come along the expressway and will reduce the travel to around 50 minutes. Dholera will also have an International Airport, which will be the 2nd airport for Ahmedabad. It will become the state’s biggest airport which will include Passenger terminals for Domestic & International flights and also a dedicated Cargo terminal for freight movement. Thus, connectivity, infrastructure and strategic location make it an attractive location for industries. 2. What steps/plans are in the offing to develop Dholera SIR into a global manufacturing and investment destination ? Dholera was envisaged as a Greenfield industrial city to cater to the requirements of industries by offering them clear title land, reliable utilities and single point of contact for all the approvals. Further, to make industries competitive, all efforts have been made to reduce life cycle cost for industries so that businesses can become more competitive in the globalised world. Besides this, the Government of Gujarat has very attractive incentive policies covering the complete spectrum from Start-ups to Mega & Ultra Mega Industries. There are also sector specific policies such as defence and aerospace policy, IT and electronics policy, garments and apparel policy etc. and policies for setting up skill development and training centres to cater to whole gamut of requirements of industries. Thus, a transparent policy driven eco-system, coupled with world class infrastructure, provides great opportunity for companies to setup their operations in Dholera. 4. How do you see the Vibrant Gujarat 2019 as a prospective to the Dholera Special Investment Region ? This kind of mega project takes lot of time in studies, environmental clearances, design, planning, and implementation. To put this in perspective, the biggest contract for Roads and Services was tendered in 2015 and construction work started in March 2016 with a timeline of 42 months for its completion. The area of our first phase, called activation area is having an expanse of 2254 Hectares, which is roughly half of today’s Gandhinagar city or about the same size as the island city of Mumbai. Finally, Dholera, a dream project is becoming a reality. Vibrant Gujarat 2019 is a great opportunity for us to highlight coming of Dholera. Therefore, as part of Vibrant Gujarat promotions, official delegations went to 24 countries to highlight strengths of Gujarat as a business and investment destination. Dholera has been showcased in all these events which has raised awareness about Dholera. As a result, large number of companies have visited Dholera in past few months and many more are scheduled to visit the site during Vibrant Gujarat summit. Talks are going on with many companies, both Indian and multinational, and we are expecting to finalise land allotment to some of these companies very soon. 5. How has been the progress of the Dholera SIR smart city project ? The projects worth Rs 3,000 crore are already under implementation. We are also coming up with a City Integrated Operations Centre which will be equipped with state-of-the-art systems to get feed from whole city through CCTV cameras, SCADA system and sensors. This feed will be analysed and data will be made available to residents and industries to plan and run their operations in a better way. This will also help administration run the city in a truly smart way. With this integration, we are bringing all the components of Smart City under one roof. Dholera is Industry 4.0 ready and will host new age industries that will bring new opportunities for our youths. Recognizing that great cities around the world have a strong educational and research component, we have entered into an strategic partnership with Indian Institute of technology (IIT), Delhi to set up incubation centre in Dholera for developing and promoting new technologies. Through designs, systems and tie ups with renowned research institutions, we are motivated to make Dholera a city that will derive its strength and competitive edge by remaining innovative, agile and sustainable. Dholera, with high green cover, parks, public spaces, well designed communities, wide pedestrian pathways and cycle tracks is India’s first Platinum rated city. With provision of high standards of social amenities and 10% land for housing for economically weaker sections, Dholera is poised to be a more humane city, where all sections of society can enjoy a good quality of life. We are confident that Dholera will usher a new era of holistic living and will become a role model for future Greenfield cities in India.